You have heard the horror story a dozen different ways — at a cocktail party, from your neighbor, by the coffee machine with co-workers: the kitchen remodeling project from hell. 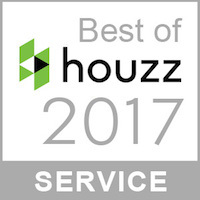 The tale of woe may include unanticipated cost overruns, inferior products that did not meet expectations, cabinetry or flooring finishes that looked “different” under the new kitchen lights, unexpected and frustrating delays, and homeowner exhaustion and annoyance with the entire selection process. Why are these nightmare scenarios so common? 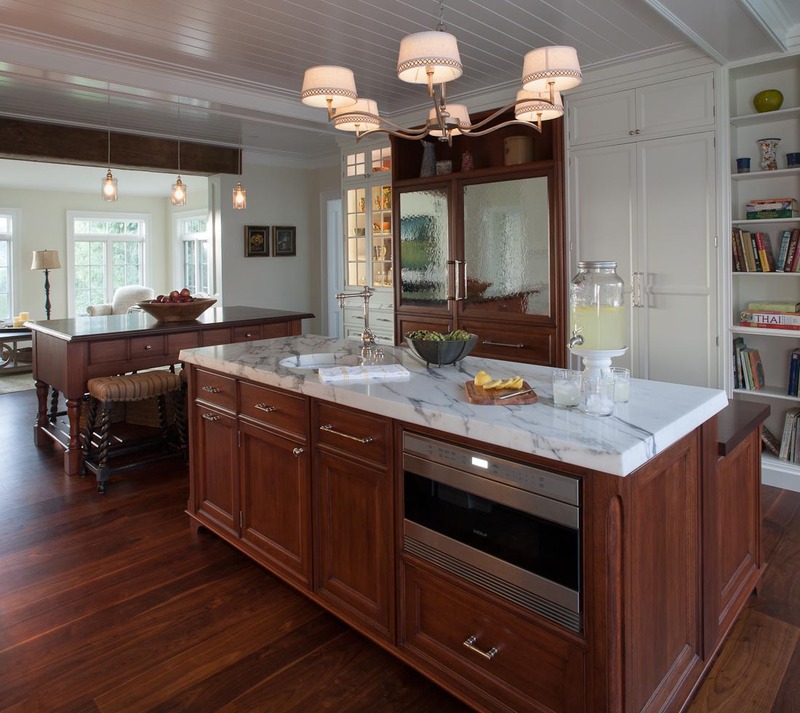 From my vantage point as a professional kitchen designer, homeowners and contractors almost always underestimate the complexity of a kitchen remodeling project, and overestimate their abilities to successfully plan, coordinate and manage the myriad details involved in a kitchen remodeling project. This is not because either party is “inferior” or incapable. Rather, it is simply because there is a chasm between the two parties which, unfortunately, does not become apparent until the project is well underway. 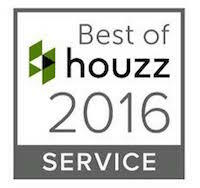 At the project’s inception, the contractor’s and homeowner’s mindsets are similar. Both are eager to define the project’s scope as quickly as possible, formulate and agree to the contract, and begin the work so that the homeowner can soon enjoy the beautiful new kitchen. Often, the homeowner anticipates that the kitchen will be finished in time for a special holiday or a significant family celebration. The floor plan layout does not meet the homeowner’s expectations. The selection process is too overwhelming and time-consuming for the homeowner, often expressed as “no one told me to expect that this much work was required”. This is when the realization dawns on the homeowner that the kitchen they envisioned — the kitchen that they believed they were going to get — will end up costing far more than what they originally anticipated, due to additional installation requirements or changes in the overall scope of the project. 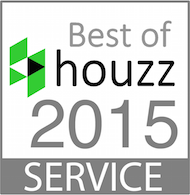 Now the dynamic between homeowner and contractor begins to break down. The contractor wants to finish the job so he can move on to the next one, but the homeowner is “stuck” — overwhelmed and paralyzed by the sheer amount of product information they must absorb and choices they must make for the project to proceed on schedule. Homeowner budget constraints also become a concern at this juncture. The contractor is unhappily thrust into the unenviable position of having to design and assist the homeowner with decisions. The remodeling job “stalls” while the homeowner requests changes in the scope of the original project. Patience wears thin and then stress levels rise. First, homeowners need a reality check. 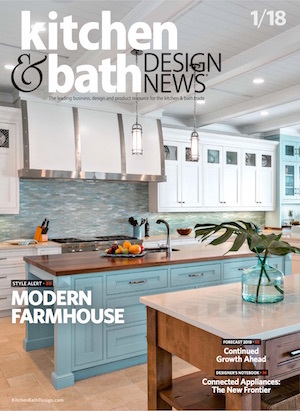 Most noteworthy remodeling projects involve design and selection decisions that are far more numerous and complex than anticipated. For example, consider the wide range of kitchen appliances (ovens, cooktops, microwaves, refrigerators and dishwashers) which must be evaluated and priced before a selection can be made. Combine this one agenda item with decisions involving kitchen floor plan, paint colors, flooring selections, countertop selections, sink and faucet selections, cabinetry selections, and lighting fixtures, and you can appreciate how the homeowner and the contractor can benefit from working with a kitchen design professional to guide the decision making and selection process. 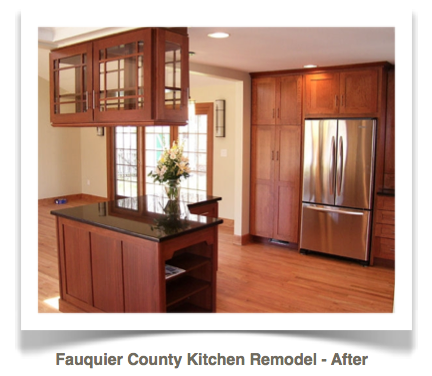 A professional kitchen designer will save you money, time, and untold stress during the kitchen remodeling process. Perhaps most importantly, a professional kitchen designer will ensure that the your kitchen remodeling project proceeds smoothly and on schedule so that the whole process is enjoyable. A reputable and caring professional will help you get the kitchen you want within your budget and protect you from unexpected and unpleasant cost overruns. Partnering with the right kitchen designer from the beginning will instill you with confidence throughout the process and reward you with the beautiful and functional kitchen you envisioned. 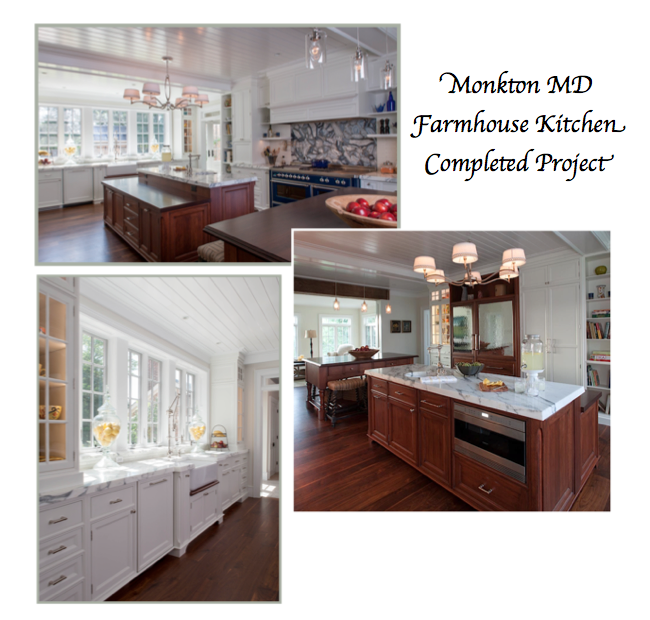 Sandra Brannock has designed beautiful and functional custom kitchens for clients throughout Northern Virginia and the metropolitan Washington, DC region. 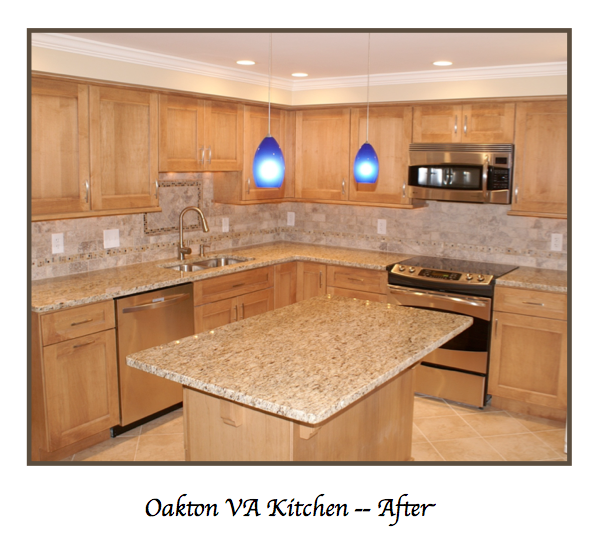 For more information, call Sandra direct at (703) 801-6402 or email sandra@expertkitchendesigns.com. 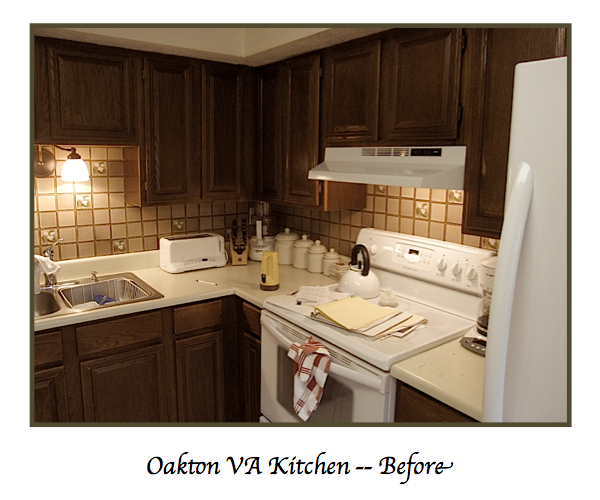 This proverbial Double Income No Kids (DINKs) couple were tired of their depressing kitchen. It offered no place for friends and family to gather and the cooking area was cramped into the corner. The dark oak cabinets and drawer boxes falling apart when opened further increased the overall frustration and feeling that “this kitchen is hopeless.” At their wits’ end, they made a path my door. When this couple first came to me, it was obvious that the budget was a big concern. They had listened to advice from many others spanning the subjects of costs, remodeling frustrations, and how to achieve the look they wanted. They were understandably confused and unsure which way to turn. We sat down together and discussed their expectations. I educated them about the cost elements for their kitchen, including cabinetry choices (which are typically the biggest material cost factor in a kitchen remodeling project). Our conversation immediately eliminated their fear because now they knew what to expect and were ready to embark on the kitchen the remodeling journey. The second challenge for them was deciding upon their style. My second meeting began by visiting their home to solidify this. We discussed other elements in their house that they liked—the furniture, artwork, and color scheme. I asked them: “What makes you feel good?”. After some productive dialogue, CAD drawings and finish comparisons, we settled on a design scheme. We hired a reputable remodeling contractor with whom I had worked. I cannot end this story without giving out thanks to the fabulous remodeling contractor who was exacting in his attention to detail. 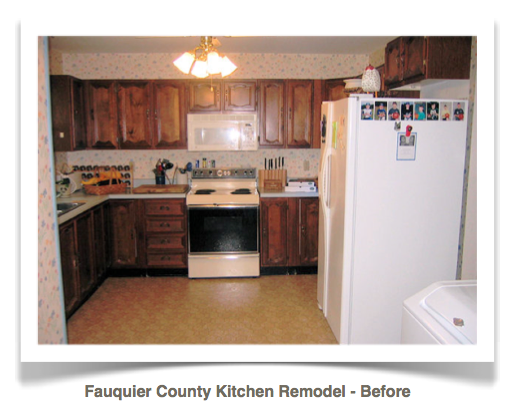 The total cost for this kitchen remodeling project was $46,700. This circa late ‘70s /early ‘80s kitchen became the main focus for a husband and wife, both married for a second time. The short story: for a brief time, this was his “bachelor” pad before he met her. Boy meets girl, they fall in love and homes merge together with his home as the main residence. Her “mission”? Update the kitchen! 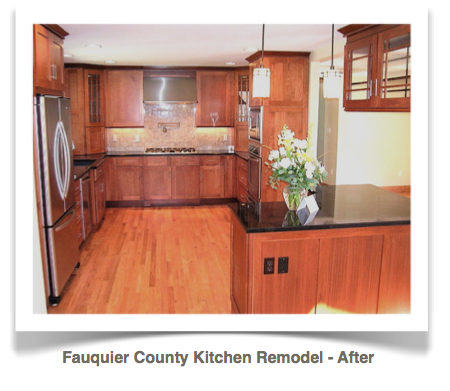 New appliance, cabinetry, countertop, floor/tile, fixtures and a new kitchen window were installed to ensure the space was completely up-to-date. The kitchen’s most important functional design objective was to open it up to adjacent family and dining rooms. This required removing the lower eastern and southern walls. 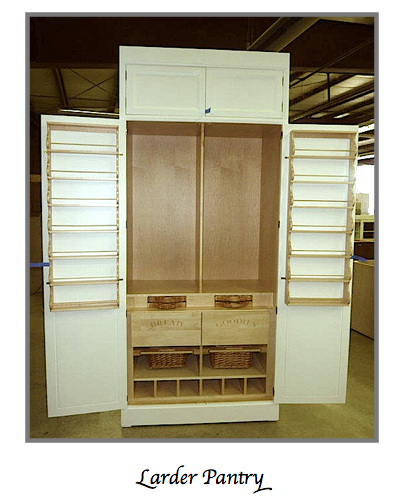 Full overlay Shaker door-style Cherry cabinetry. Engineered Oak floors matching the same in dining room and family room to allow for continuation of the space. Mission type lights over the L-shaped island allowing informal gatherings as family and friend linger in the family and dining room. Recessed lights and under cabinet lighting throughout. All lights have dimmer switches in order to transform task and general into ambient lighting. The most unique piece: a suspended wall cabinet with glass and Mission mullions on all four sides with lighting in the interior. Overall cost of this project including labor and installation: $80,000.